Sometimes I just cannot figure Him out, can you? I signed up to have a vendor’s booth at two women’s conferences. The first was a sort of last minute thing. It was held at a church, so space was limited. The meeting was in a separate section and us vendors were in the education wing. I sat with my table of books in this Sunday school room surrounded by brightly colored children’s decorations taped to the walls and thought, “How is this going to work? We are down two halls and around the corner from all the action.” It did. I almost sold out of every one of the five books. In a panic I spent the next Monday calling publishers because I had a huge women’s conference that next weekend. By the grace of God alone, they all arrived the day before my next conference – the one I’d been anticipating for months. The vendors were front and center between three women’s groups meeting at that conference center. We sold more to each other than any of the women – well, almost. Anyway, I didn’t even cover the cost for my gasoline down and back in sales. And besides that, I clearly heard Him tell me to give two of my novel away to two separate people – so I obeyed. I came away rather disillusioned. On Sunday I spoke to 28 people at a church adult ed class at a huge downtown church. Two months ago, they had booked me to speak to the singles group. I expected people in their early 30’s and late 40’s. I was the youngest one there by at least 20 years! I only sold one book- though they all shook my hand and said I was the best speaker they’d had in a long time and asked if I would return. Humble yourselves, therefore, under the mighty hand of God so that at the proper time he may exalt you, casting all your anxieties on him, because he cares for you. (1 Peter 5:6-7 ESV) (Emphasis mine). Over the past two weeks I have met tons of people, shaken quite a few hands and handed out my flyers with my speaking topics and books listed. Women leaders from over twenty-five churches (or more) now have my web address, phone number, and my Q reader code. Looking back on it, I have no idea how much “bread I have cast upon the waters”- but God knows. He also knows my needs, economically and spiritually as one who writes and speaks not only about Him but for Him. Once again I got my answer- written two millennium ago by one who followed Him, denied Him and then became the rock of His church – Simon Peter. Cast all my anxieties on Him because He cares for me. Let God exalt me in His perfect timing- not mine. Yes, Lord. 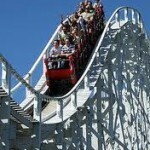 I will crawl back into the seat and ride this roller coaster again and again, trusting in You because You know the way. You know the hills and the valleys, how fast we are to go and how slow. I will hold on tight. 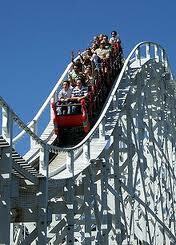 In the roller coasters of your life, will you do the same? Get ready for the ride of your life – oh, wait. It is your life. Mine, too. I’m glad My Master is in control, and I have His hand to hold onto when it gets scary.